Inspiring the next generation of space explorers and scientists at Kennedy Space Center Visitor Complex, one of America’s most-loved visitor attractions, thousands of visitors were taken on a first of its kind, high-tech journey into space for Spirit of Exploration held during the festive season from December 2015 through January 2016. Originally commissioned by NASA for the Apollo program, the 223-foot long Saturn 1B rocket located in the open air Rock Garden was transformed into a giant projection surface comprising an eye-watering 6,528 by 1,050-pixel image that used 80,000 lumens of projected light. Visuals were accompanied by a dramatic musical score, actual launch audio, and other sound effects, in conjunction with a “Rocket Garden Light Show” that uses moveable lights to illuminate rockets throughout the Rocket Garden, complete the immersive sensory experience. The presentation, back for its second year, took guests on a journey through NASA’s history and plans for the future. It used custom animation blended with historic footage of actual launches and awe-inspiring views of Earth to create a completely unique outdoor cinematic experience, complete with stadium-style seating. To create the spectacular, Delaware North turned to long-term partner and integration experts AV Matters to perform projection mapping, lighting, and sound. 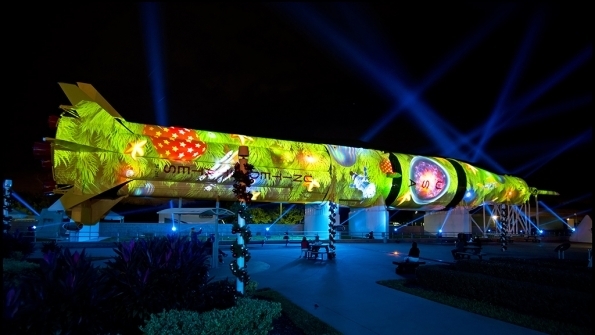 “The unique challenges for this project were the length and curvature of the rocket and to ensure that the striking visuals could be seen from all angles of the festive display,” explained Phil Maingot, managing director at AV Matters.